Chantal Desjardins is enjoying life as a stand up comic. The gal with the movie star looks had a good career going for her on local radio, with gigs on Virgin Radio, CHOM and latterly on CJAD where she did sports and showed real on air karma with drive home show host Aaron Rand. When Bell Media purchased Virgin, CHOM and CJAD, essentially merging TSN 690 with the latter, Desjardins was one of the casualties. Desjardins, 31, can still be seen on occasionally on CTV, but what began as a bit of an extra curricular activity is developing into something more. She will be onstage at Club Soda on St. Laurent Blvd. 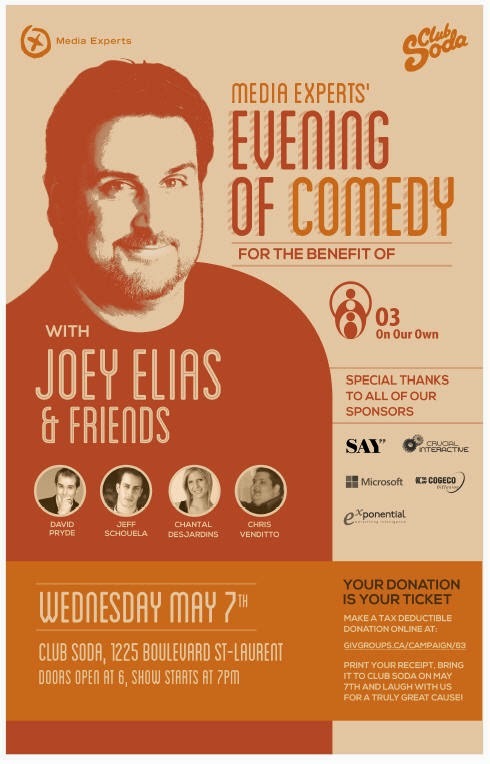 Wednesday evening, May 7 for the MediaExperts’ Evening of Comedy with Joey Elias and Friends. The third annual edition is once again being held in support of On Our Own, the Montreal‐based organization providing critical support services and affordable transitional housing for young parents wishing to develop the skills they need to live independently in the community. Independent media services agency Media Experts has partnered with On Our Own and Canadian charitable organization, GIVGroups, permitting the public to secure their entry to the show by making a tax‐ deductible donation online. Created to help boost charitable giving in Canada, GIVGroups is a website where Canadians, companies, foundations and charities come together to support charitable causes. GIVGroups hosts matching giftchallenges helping to multiply the good deeds of corporate sponsors with the matching donations of Canadians to increase the value of those donations. On the GIVGroups website, http://www.givgroups.ca/campaign/63 people simply select the On Our Own ‐ Media Experts GIVGroup and make their tax‐deductible donation. The public have only to present the printed receipt of their minimum donation of $40 to be admitted to the comedy benefit on May 7 at Club Soda. Could Desjardins end up at Rogers Sportsnet/City Montreal, where there is currently a vacancy for a local correspondent? 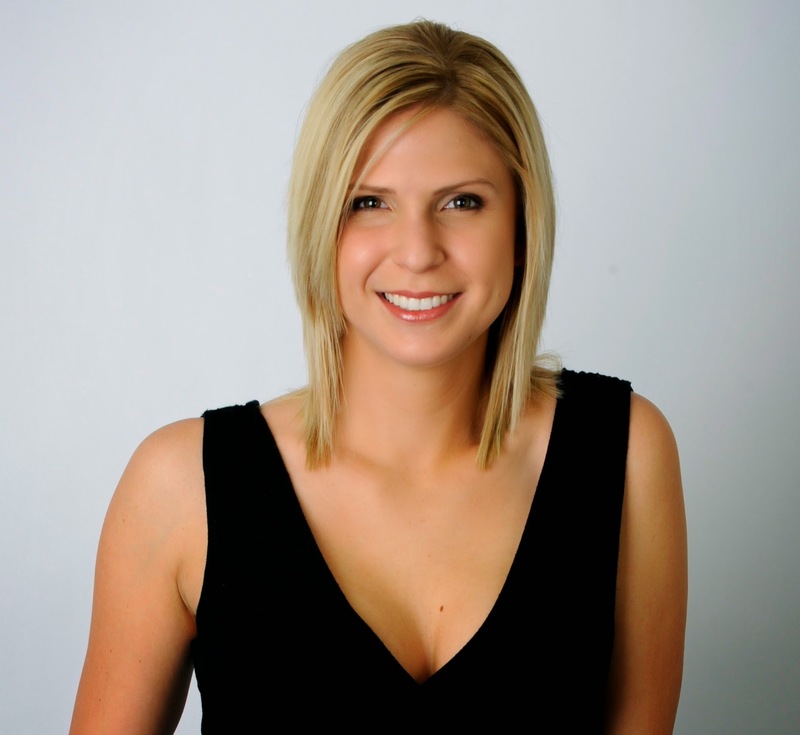 One would think that both she and Jess Russnak of TSN 690 would be good candidates to succeed Aly Lozoff, who was doing a fabulous job yet did not have her contract renewed. There is also an opening on weekends at Virgin Radio, with Nikki Balch off to Ottawa. Desjardins would be a great fit there as well.